With the end of the academic year fast approaching, it is very much a decision time for college leavers. Do you go to University, go travelling, or do you choose the apprenticeship route? Every route has their pros and cons, but if you want to jump in head first into an office-based environment, an office-based apprenticeship is the route to go. The Apprentice Academy has two apprenticeship programmes on offer for 16 to 18-year olds who are leaving school or college this year, Business Administration at level 3 and Accountancy at level 3. 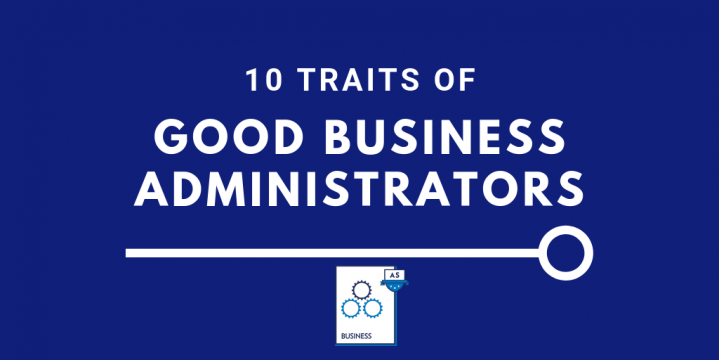 For those looking to go into a Business role, here are the top 10 traits an Administrator will need to excel in their new role. Managing your time well will mean that you can prioritise tasks, meet deadlines and will mean you spend the right amount of time on tasks. As an apprentice, it is a great trait to be flexible. Offering a helping hand where you can, is a great way to make a good first impression. If you are more organised, you become more efficient. Being more efficient, means more results. More results, mean you will be in your managers good books. Have a good filing system on your PC, make use of the tools you have at your disposal and you should be fine. Communication is key to any job role, and this is no different with administrators. This is more than just getting your point across. It also involves listening and taking instructions clearly. Don’t be afraid to express your own viewpoint, but make sure you allow others to express theirs too. With time, the more you work with the systems in place at your company, the quicker you will become. However, a high level of computer literacy is a great trait to have and will give you a head start in your new role. The Apprentice Academy includes accredited Microsoft office qualifications and training as part of the apprenticeship programme. Apprentices can choose Word, Excel, PowerPoint, Outlook, Access or OneNote as the software they would like to develop expertise in. At the start of an apprenticeship programme, it is naturel to ask questions, in fact we encourage you to do so in order to gain a greater understanding of your role and duties. However, being able to use your initiative to get on with tasks and not always rely on instruction from your line manager is a great trait to have, so that you can work autonomously. During your administration apprenticeship, it is more than likely that you will be part of a team. Having a team ethic is a brilliant trait to have, as you and your colleagues work towards a common goal. Think about the time when you were in a group project at school and there was ALWAYS this one person that didn’t pull their weight. You don’t want to be that person when in the workplace! Think about how you would want to be spoken to if you were the person making the call to a company. You’d want the person on the other end of the phone to be friendly and approachable, in some situations it might be you who has to be in that role, make sure that you are customer orientated. Honesty is a good trait for anyone in a new role. It promotes loyalty and increases trust amongst your colleagues. Also be honest if you are struggling with a task, that way you can receive good advice to make sure you get your work right! Last but no least is professionalism. At the end of the day, you are being payed to work as part of a team to make money for the company. It isn’t school or college anymore, where you might have been able to get away with a bit of mischief. Do you agree with our list? These traits are the first steps to becoming a great administrator, and a valuable member of your new team. Work hard and ask lots of questions and you will have a great start to your new career.